Of course he was. I’m certain of it. Well, no, I don’t understand the higher reaches of physics. Even the lower reaches. But scientists who do understand consider Einstein a genius, and that’s good enough for me. More than a century ago he formulated theories about space and time, matter and energy; “Life, the Universe, and Everything,” to quote a different kind of genius. Many of Einstein’s ideas seemed fantastical at the time. Yet many have been proven and are now accepted as true; resulting in (among other things) the development of nuclear power, the discovery of cosmic black holes, and the proof of gravitational waves, which three physicists in the US have just got the Nobel prize for detecting. And anyway I’m not talking about physics. I’m talking about something even more important. I was bowled over when I first read these words, coming from one of the greatest scientists of all time. As a fiction writer, I know how essential imagination is; I’d call it one of my most important tools, to be used with care but very often. My novels, set in the long-ago era of Roman Britain, need to be rooted in fact, in “all we now know and understand”, but not limited to that. Our knowledge of Roman times is patchy, ranging from pretty good in some things to virtually non-existent in others. I study what facts are known, because I want to get the historical background right when I’m trying to describe what life was like for people living two thousand years ago. Then, when the trail of facts runs out, I need imagination. Einstein’s words brought home to me that great scientists aren’t limited to “all we now know and understand” either. These days we’re encouraged to think of scientists as being somehow different from other workers: tied to facts, they construct theories that grow logically, step by step. fact by fact, making a framework like scaffolding supporting a building. So, we conclude, probably there isn’t room for imagination? 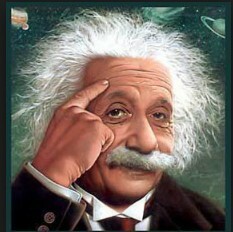 Some scientists may conform to this stereotype, but not Einstein. Part of his genius was that he was not limited. He was prepared to think outside the box, as we’d say now. He believed we all should be. And his words should be posted on the wall above every writer’s desk. Correction: posted in every place of work, from lab bench to shop counter, from assembly line to tractor cab, from mineshaft to kitchen to tv studio. “Imagination is more important than knowledge.” Everywhere.